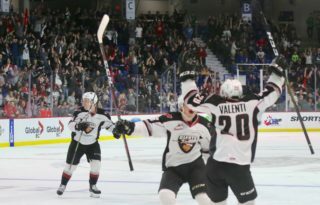 A month that started with three straight losses has ended with a 10-game regulation unbeaten streak for the Vancouver Giants. Wednesday night in Kamloops the Vancouver Giants (32-12-2-1) wrapped up their January schedule with a 3-2 overtime victory over the Kamloops Blazers (19-25-3-1). 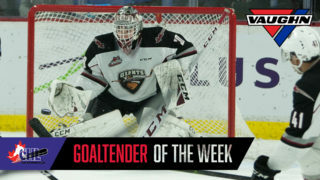 Bowen Byram scored 33 seconds into overtime, lifiing the Giants to their 32nd victory of the season and their fourth straight win against the Kamloops Blazers. Davis Koch and Lukas Svejkovsky added third period markers for the G-Men while Trent Miner made 29 saves for the win in goal. Zane Franklin and Orrin Centazzo responded with third period goals for Kamloops who got 18 saves from Dylan Ferguson. VAN – Lukas Svejkovsky (5) scored with one second remaining on a power play to give the Giants a 1-0 lead. Alex Kannok Leipert and Jared Dmytriw assisted on the play. 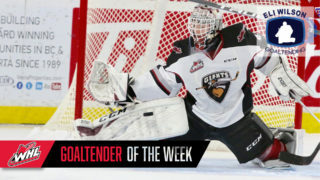 VAN – Suiting up in his 300th career WHL game, Davis Koch made his presence felt when he one-timed home a Jadon Joseph feed for his team-leading 20th of the season, extending the Giants lead to 2-0. Tristen Nielsen also assisted on the goal, extending his point streak to nine straight games. Koch’s goal came at 8:32. KAM – Zane Franklin got the home side on the board when he raced in alone on Trent Miner and roofed his 24th of the season up and over his left shoulder. Kyrell Sopotyk drew the lone assist. For Franklin it was his 24th of the season. KAM – A minute and 23 seconds later Orrin Centazzo (12) whacked home a Kobe Mohr rebound on a Blazers power play to tie the score. VAN: 33 seconds into overtime Bowen Byram (19) buried his second overtime goal in a span of two weeks. 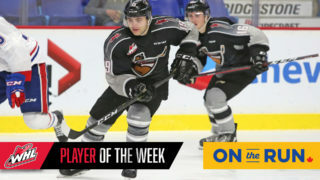 Jared Dmytriw earned the lone assist on Byram’s marker that cemented the Giants fourth overtime victory of the season. Next Giants Game: Friday night in Portland against the Winterhawks at 7:00 PM. Bowen Byram finished up an incredible month of January with 10 goals and nine assists for 19 points in 13 games. The 2019 NHL Draft prospect has scored goals in three straight games heading into Friday’s tilt with Portland. Byram has managed three goals and five assists for eight points in four games against Kamloops. The Giants have won five straight games on the road dating back to January 6th in Cranbrook. Overall the Giants are 13-7-1-0 away from home. The Giants improved their record to 15-4-2-1 in games decided by a single goal. Tristen Nielsen extended his point streak to nine games. During that span, Nielsen has notched three goals and nine assists for 12 points.